In a new series, I’ll be talking about some of my personal favourite photos, the stories behind how I captured them and discussing the thought process that led to the final image. 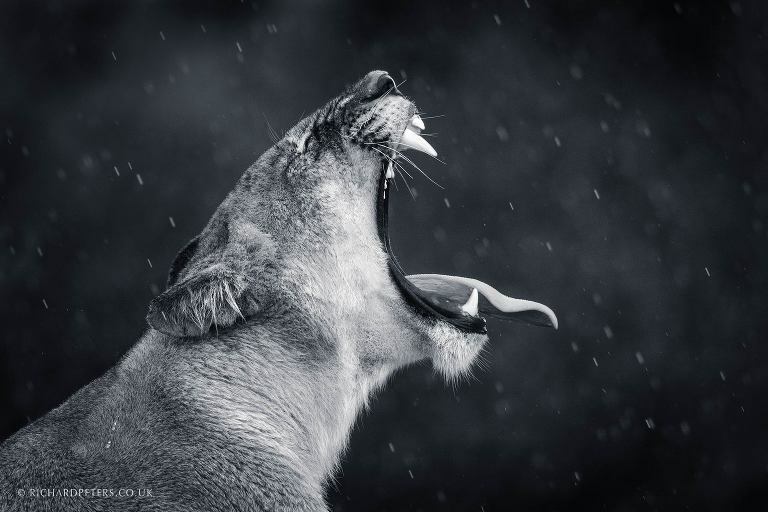 I’m kicking off with a photo of a lioness yawning in the rain. It was taken a few years ago on my first ever trip to the Maasai Mara and, to this day, remains one of my favourite lion photographs. It’s also an image that, despite favouring black and white, you’ll discover further down, found competition success in colour. Breaking the image down technically, there are several elements that come together to make this lioness photo work. To fully appreciate the yawn and extended tongue, a side profile is crucial to enhance the shape of the head. Had my position relative to the lioness been even a few degrees off, the lines would not have been so clean and visually it would have lost impact. Whilst the pose is very important and would have made for a great image in its own right, the rain adds an extra element of interest. Using a relatively fast shutter speed I was able to freeze the motion of the yawn, whilst keeping the ISO relatively low. Had I slowed the shutter down to create longer streaks of rain, there was a risk of introducing motion blur to the lioness. The lens was stopped down one stop, from f4 to 5.6, to give me enough subject depth of field and keep the background nicely diffused. This larger depth of field also added slightly more definition to the rain. Combining all these elements together also required a clean background, to allow the lioness and rain stand out. As you’ll read further below, having everything come together was an exercise in persistence. This type of thought process are always flowing through my mind when I’m trying to capture my next image. Often the photo is about so much more than just the subject, and each image is the result of consideration and internal thoughts before the shutter is released. The onset of rain is something that is often hoped for when on safari in the Maasai Mara. Whilst warm hues and soft light are always appreciated, wet weather can be perfect for adding a sense of drama and extra impact. As we made our way across the plains, the first few drops of afternoon rain quickly turning in to a series of showers. All we had to do was find a suitable subject. With rain showers coming and going, varying in severity, the Mara was unusually quiet as we drove along its bumpy and winding roads. Just as frustration was beginning to loom, we found a lioness sheltering from the wet weather along a tree-line. She was tucked in to the bush and appeared to have no intention of getting wet. Having seen nothing else of interest, we decided to turn the engine off and watch for a while. The latest rain shower subsided but it was around 45 minutes before she showed any sign of real movement. When she did, she sat up and appeared very alert. Glancing round we saw the sight of a second female, approaching from behind our position. Our lioness sprung up and headed out into the open and we sat and watched as these two beautiful animals greeted each other. Like domestic cats, one would playfully roll around on the floor and they sat with each other for maybe 15 minutes before parting ways. We followed our original subject down the path where she took up residence on a small mound. Another light rain shower passed over but, despite now sitting out in the open, she was directly in front of a bush. This resulted in an incredibly un-photogenic background that even my 600mm f4 was unable to hide. More problematic however, was that our new position was also blowing rain straight into the side of our jeep. Opening the window to take a shot would quickly render the front elements full of water. When you can see an image developing, it’s always worth waiting. With the initial idea simply being a photo of a very wet looking lion, this became pushed to the side the first time our lioness yawned. From the moment that happened, it was clear there was potential for a far more captivating photo than just a soggy lion. The rain eased on and off and despite the occasional yawn over the next 30 minutes or so, her position didn’t allow for a photographic opportunity. It’s always frustrating when you can see a great image is in reach but something isn’t quite working. She repositioned a little during that time, replacing the bushes directly behind with a background split between ground and sky. Light levels were changing frequently as rain showers passed by but now, with a lot of white behind, the rain wasn’t showing up very well. An unflattering background of land and sky. We must have sat there for another half an hour and during that time had three different jeeps pull up. Each had photographers but they only waited with us for maybe 10 minutes before heading off. A resting lion may not have interested them or it’s possible they’d already nailed a great image elsewhere, when the rain was heavier. Regardless, they left us to it. All too often you can end up with a small army of jeeps on a sighting, so being left alone was very welcome. It wasn’t long after the third jeep had gone that our persistence was rewarded. Our beautiful big cat once more repositioned and finally we were able to get a view of her with a clean background. We could now reposition too, removing the obstacle of rain being blown into the lens. I now kept my eye to the viewfinder, worried that if I looked away I’d miss my chance. Finally the wait paid off and she gave us one final yawn before standing up and heading onwards. It was the only opportunity needed. Despite the old D800 I was using not being the fastest camera off the block, the sequence of images included a fully open mouth with tongue perfectly outstretched. Finally the rain fell, the lioness yawned, and the image was captured. A debate on Black and White versus Colour. Which do you prefer? Different photos favour different approaches and with Lioness, I’ve always felt the drama and mood is enhanced with black and white. The greens darken down nicely allowing the rain to stand out. Fur detail is enhanced and the atmosphere is stepped up a level. However it was the colour version which gained recognition in Windland Smith Rice Natures Best competition, not long after I took it. Winning the African wildlife category it went on to be displayed, in conjunction with the competition, at the Smithsonian Museum of Natural History in Washington. I often show both at talks, asking the audience which is preferred. More often than not, black and white comes out on top. Photography is such a subjective thing that different opinions can often be reached, both for and against any aspect of a photo. With that in mind I’d love to know your preference. Which version of this image do you prefer? Richard Peters is a Surrey based professional wildlife photographer, Nikon Ambassador, and one of the few British photographers to receive the accolade of European Wildlife Photographer of the Year. He is known for a style that often favours dramatic use of light, runs wildlife photography workshops and, from camera clubs to big industry events, holds talks about his work. If you'd like to know about Richard's latest blogs, workshops and more, all designed to help you improve your photography, join the newsletter today.